Perhaps you have accumulated a lot of data on your tablet and you’re ready to make some room by transferring it to your PC. Maybe you have important pictures, videos, or other files on your iPad and you want to back them up so that you won’t lose them. Thus, an iPad transfer tool that was made specifically for these purposes will helps a lot! iMyFone TunesMate is an easy-to-use program that you can install on your PC or Mac. It can transfer almost all iOS between iDevice and iTunes/PC. It’s one of the best iPad transfer software suites out there. Lots of famous media strongly recommend it to be must-have, like Geekreply, tricksworldzz.com. It can help you transfer Music, Playlists, Movies, Camera Roll, Photo Library, Podcasts, iTunes U, TV Shows, Audiobooks and more. You can transfer both to and from your computer/iTunes, as well as other devices. 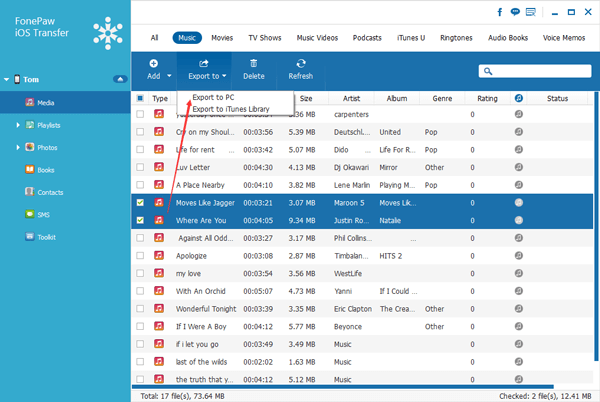 Transfer from/to iTunes library - TunesMate Sync your data in a more efficient way, you can transfer media file from dofferent iDevices to iTunes and then sync the files to you wanted device. Transfer from/to PC - With TunesMate, you'll be able to freely transfer files from our iDevices to computer, as well as add PC files to iDevices. Rebuild iTunes Library - In case that your iTunes crashed, by transferring all your iOS files to iTunes library, you'll have a huge collection of music without purchasing them again. Step 1: Download TunesMate and then install it. Connect your device to PC via USB. Step 2: Click on your device where you see it listed in the interface of the software. 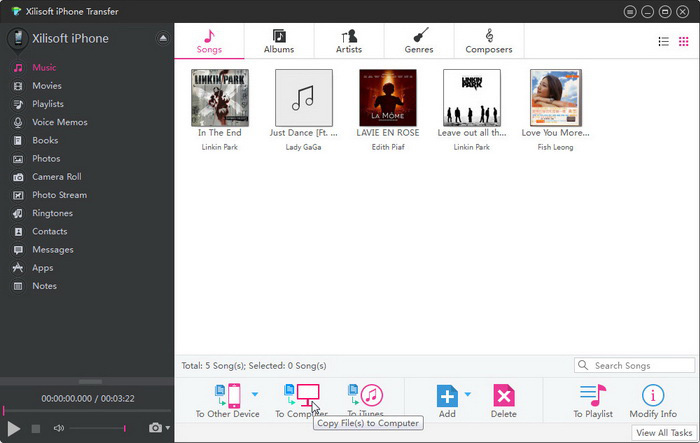 Step 3: Choose “Music” as the file type. All the songs on your device will be viewable on the right. From there, just select and export the files to PC. Our second choice for iPad file transfer software is Xilisoft iPhone Transfer. This is a simple program will do more than iTunes and help you transfer just about every multimedia file from your device to your PC. It’s a good general device manager to have if you use iOS extensively. The ability to not only transfer media, but to convert it into formats that are usable for your iOS device if need be. The ability to download and convert videos that you find online and make them playable on your device. It works as iPad to Mac transfer software, or iPad to PC. It’s a great software suite, and the company makes many other kinds of useful iOS-centric applications. You may want to check them out. Like our other two offerings, FonePaw allows you to transfer nearly any sort of file format between your PC and your devices. It’s also extremely simplistic to use and sports a very intuitive interface. The ability to transfer everything with just a single click. The ability to back up everything and restore your contacts, also with a single click. You don’t have to very computer literate to use it. Just for its easy of use, this application was certainly worth a mention.